Posted on September 28, 2009 by Alicia Bay Laurel	in Blog. 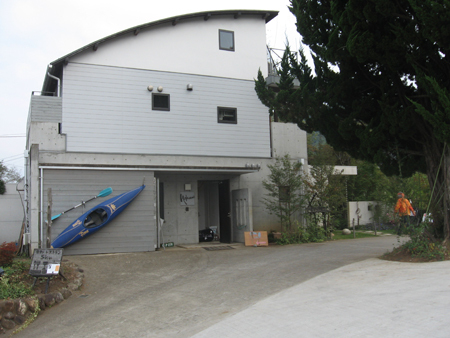 I am the guest of TV producer Setsuko Miura, her husband Jun and their daughter Ren, in the very hip art and farming village of Fujino, in the mountains west of Tokyo. They have arranged for me to teach a class in making instant books at the local Waldorf School, which they helped to found, and which Ren attends. 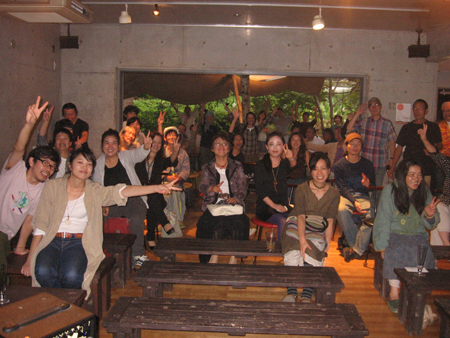 They also arranged a fundraising concert for the school at Shu Café in Fujino, at which I perform for about 50 people. 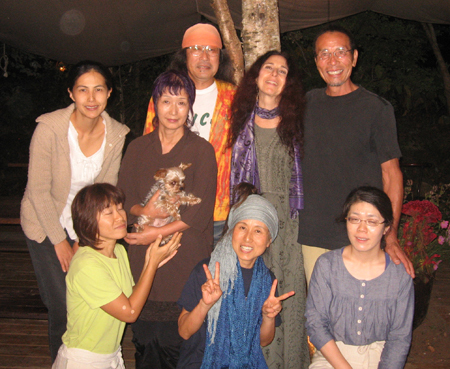 In this photo, Jun and Setsuko are the two people with headscarves. Shu and his wife Kazu, the owners, are on either side of me. Kazu has purple hair and a very small dog in her arms. The other three ladies are part of the café staff. Shu Café is downstairs from an airy loft that is Shu and Kazu’s home. Next to it is an organic garden where Shu grows vegetables for the café. 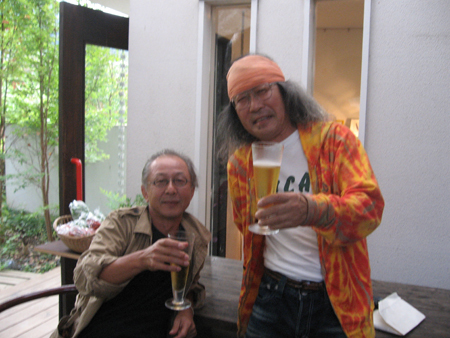 The elegant and natural café and residence were designed by Tsutomu Nozaki, the same architect who designed Jun and Setsuko’s ultra-green home, here enjoying a beer with Jun. 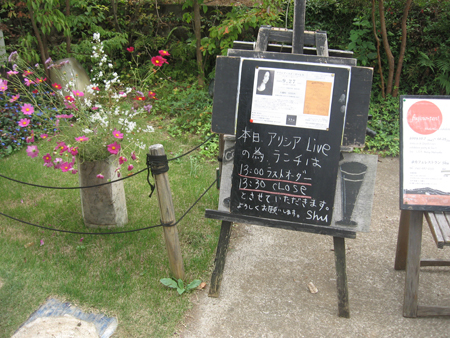 An easel outside the main café entrance announces my concert. 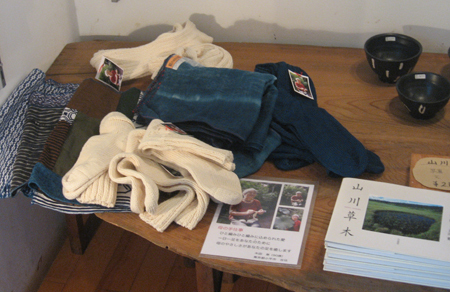 A small gift shop inside the café includes organic cotton socks, hand dyed with locally grown indigo and hand-knitted by a 90-year-old resident of Fujino. 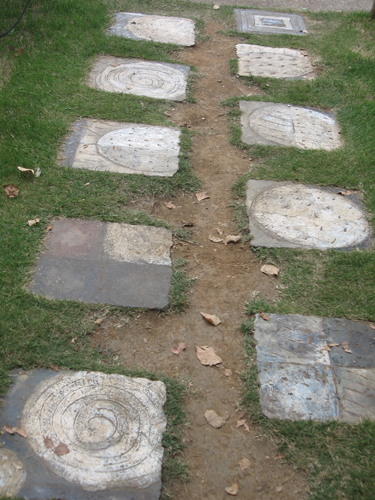 Every aspect of the café features local art and organic produce, including the stepping stones at the entrance to the café. 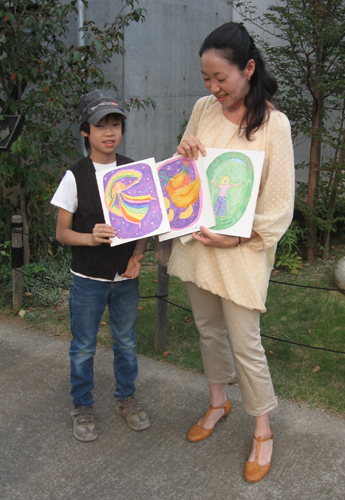 Setsuko and Jun’s neighbor, Aki, one of the first of the audience to arrive, brought her long-out-of-print copies of the 1974 Japanese editions my three children’s books to sign for her and her children. I met legendary singer/songwriter Ua, who lives in Fujino with her husband and two young children. 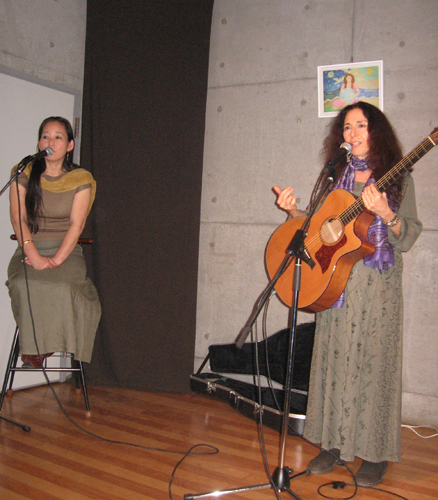 I sang and told stories, with the excellent translation of beautiful Yuko Urakami, the English teacher at the Waldorf School to whose 12th grade English class I taught the instant book lesson on September 24th. 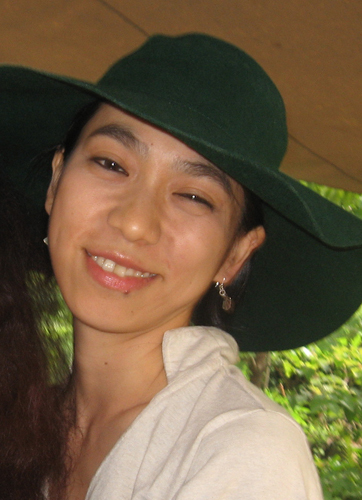 She also has children who attend the school, and is a close friend of Setsuko’s. We had a full house, a most enthusiastic audience, except for the children seated in the first three rows, who were outside playing together. After the show I signed books and CDs, and got my photo taken with lots of new friends. Everyone was so sweet.